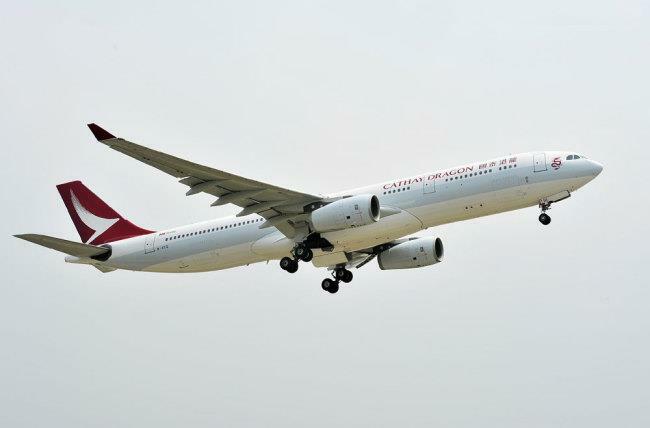 TAIPEI, April 8 (Xinhua) -- A Cathay Dragon plane carrying 317 passengers bound for Hong Kong had to make an emergency landing in Kaohsiung City in southern Taiwan Monday morning after one of its engines started spewing smoke over suspected collision with birds. Cathay Dragon flight KA451 made an emergency landing at the Kaohsiung International Airport at 8:31 a.m. after pilots reported smoke coming from one of the jet's engines, the airport's control tower said. The plane, an Airbus 330, took off at Kaohsiung at 8:02 a.m. Monday and shortly reported the right engine was emitting smoke over suspected collision with a flock of birds, according to the control tower. The jet circled back toward Kaohsiung and dumped fuel before its successful emergency landing at 8:31 a.m.
After the plane landed, airport and city fire fighters stood by, but luckily no fire or injuries were reported. Cathay Dragon said it would arrange alternative flights for passengers as soon as possible and apologized for the delay.